Critchley, Simon. 2012. The Faith of the Faithless: experiments in political theology. London: Verso Books. Under the encouragement of a friend, I’ve spent the last six months reading a lot of Žižek. This has been simultaneously pleasurable and infuriating because while I love Žižek’s style (and even agree with him on many issues), I find the politics implied by his more recent turn to Lenin and praise of “divine violence” to be profoundly troubling. (I also radically disagree with Žižek’s analysis of religion, but I’ll save that for a later blog post). My interest was piqued when Žižek condemned the British born, New School-based, political philosopher Simon Critchley, stating that Critchley’s work was “an almost perfect embodiment of the position to which my work is absolutely opposed.” When I then heard that Critchley had made a recent foray into Religious Studies that was getting a lot of attention, I knew that I had to add Faith of the Faithless to my reading list. Having done so, and having cajoled friends and colleagues to read and discuss it with me, I am now in a position to report back some observations. In effect, Critchley considers all politics to be religious. He suggests that theological concepts are so heavily intertwined with political concepts that in order to have a functioning politics, politics must escape itself by articulating a relation to the transcendent. 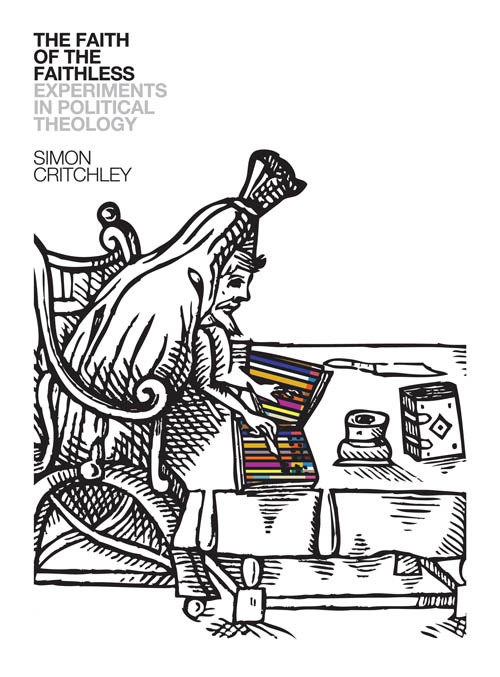 As a committed atheist, this puts Critchley in a bit of a bind, which he tries to solve by constructing a kind of atheistic political theology. Basically, Faith of the Faithless is an attempt to think about how to organize a new Left politics in the face of the Death of God (or the confrontation with relativistic nihilism). Interestingly Critchley tries to conjure this new political community not by drawing attention to society’s injustices (classic liberal guilt), but through appropriating an explicitly theological language.